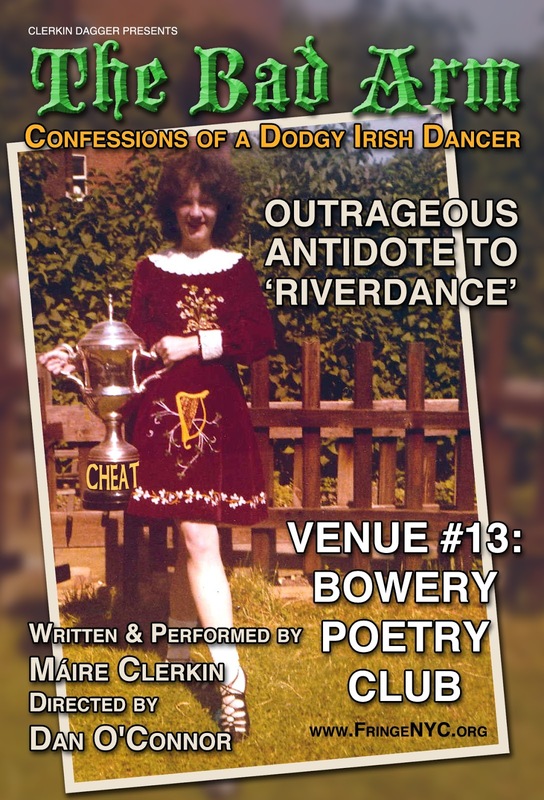 The Bad Arm - Confessions of a Dodgy Irish Dancer will be performing at the Bowery Poetry Club, 308 Bowery, New York, NY 10012 as part of the New York International Fringe Festival, 13, 14, 17th, 18th & 20th August. The one-woman show, written and performed by Maire Clerkin and directed by Dan O'Connor has toured in Chicago, Dublin and Los Angeles. Clerkin describes the autobiographical dance-play as an antidote to Riverdance. She wants to show a side of Irish dance that the public rarely sees. "Raw rhythms, tall tales and arse-clenching comedy - but no glitz whatsoever; hence its description as the antidote to 'Riverdance'." For more information, visit maireclerkin.com.